Lovely Professional University Directorate of Distance Education is growing as one of the most innovative institution offers distance education in India. DDE is one of the part of India's largest private university Through affordable education, online resources and a network of Study Centres, DDE intends to reach the unreached. Today where distance education has become second name of higher education, LPU has bring the higher education to the laptop screen through it's innovative cutting edge technology & a wide network of study centers. The institution provides education to everyone whether you're a student, working professional or house wife. As we all know Distance Education a convenient mode of affordable and anytime-anywhere quality education in a technology-rich environment. LPU has open a door for all desirous candidates who wish to pursue further studies by offering various undergraduate, postgraduate & diploma courses. 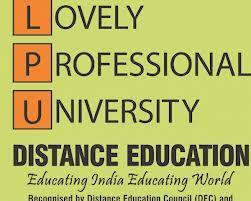 Lovely Professional University is accorded Regular Recognition by the Distance Education Council (DEC), an apex body for the Open and Distance Learning (ODL) system in the country, and Joint Committee of UGC-AICTE- DEC.
LPU e-Connect is an award winning 24x7 portal which work as a strong online connection between Students, Study Centres and the University. 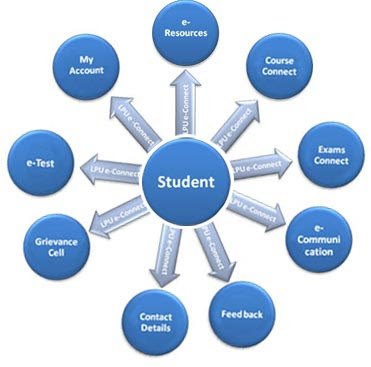 It enables students to learn as per their preferred time. Students enrolled under LPU DE are allotted a personalized User ID and Password through which they can access various interactive and dynamic features. LPU Offers the following distance education courses. You can take admission at the University/ Study Centres. You may also download the Application Form from the website (www.lpude.in) and submit it through post, along with all the relevant documents, at the University or at the Study Centre of your choice. All the details e.g Eligibility Criteria & Fee is mentioned in prospectus as well as on university website.